Dim sum items prepared by Hong Kong trained chefs. 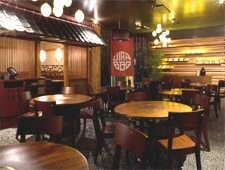 : Jian, the former stylish Korean barbecue spot, was revamped to become Bao Dim Sum House, specializing in dumplings and other small plates. The place is attractive, with a Buddha fountain at the door and contemporary lanterns hanging over the tables. 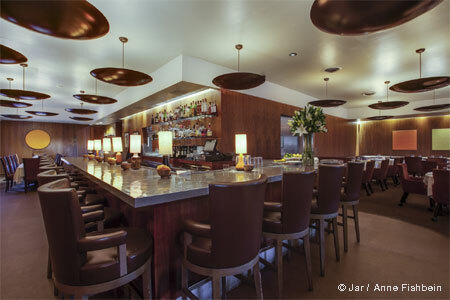 The bar, specializing in white lotus cosmos and mango martinis, is seductively bathed in red light. The selection of dim sum --- delivered by way of table service, as opposed to the traditional carts --- is extensive, including crystal shrimp dumplings and baked barbecue pork buns prepared by Hong Kong-trained chefs. Chicken pot stickers, one of the best dishes, are shaped like crab cakes and laced with spinach, while miniature pork dumplings ooze hot broth when pricked with a chop stick. Other dim sum standards, like sticky rice wrapped in lotus leaf and scallion pancakes, are also well executed. For dessert, there are sweet sesame balls and egg custard tarts. Happy hour (Mon.-Fri. 4 p.m. to 7 p.m.) offers discounted dim sum, cocktails, beer and wine.